Laser Materials Market Report « Global Market Insights, Inc. Considering the increasing proliferation of laser technologies in medical space, Laser Materials Market demand is undoubtedly set to grow substantially in the forthcoming years. Technological interventions have not only influenced laser materials portfolio but also have widened the application scope of the market. An exemplary transformation in the therapeutic model in terms of medical facilities has acted in favor of the business growth. For instance, shifting trend toward replacing non-laser technologies across various domains that include oncology, neurology, and dentistry has been immensely catapulting the market expansion over the years. Speaking of healthcare, laser technology has already gained a momentum in this space and with technological advancements, it is anticipated to unfold a series of new opportunities, leaving a subsequent impact on laser materials market. With digital disruptions globally, the volume of data has been exponentially increasing across various industries. Communication sector is one of the profound spaces witnessing the proliferating penetration of laser materials. 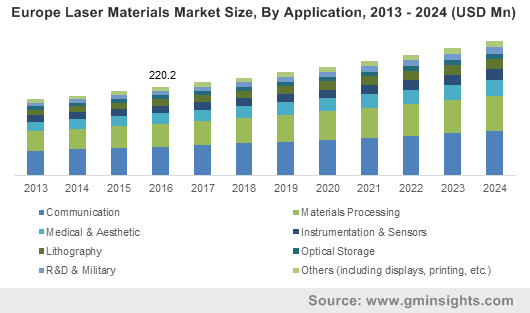 Communication applications procured one-third of laser materials industry share in 2016. Military applications have been also gaining a traction lately. High demand for lightweight cost-effective armaments has resulted in the utilization of laser materials in this domain. Key market players are also investing in research activities to extend the product portfolio to win a competitive edge in the global landscape. Geographically, Asia Pacific is one of the significant regions partaking in the laser materials market. The expanded manufacturing base along with upgraded healthcare infrastructure are the prime factors driving the regional market. China, Taiwan, India, And South Korea are the major countries contributing substantially toward the regional share. Increasing population in APAC is also a vital factor enhancing laser material market dynamics. With a significant contribution toward the overall revenue in 2016, APAC will continue to be a strong participant in the global laser materials market in the years ahead. Laser technology undoubtedly is one of the most commendable innovations of the twentieth century. With a broader spectrum of application across the healthcare, military, and communication, laser materials market penetration has generated a remarkable momentum. Reduced material prices coupled with their reliability and enhanced lifespan are further pushing the laser materials market demand. Prominent industry participants include Asahi Glass Co., Ltd, Morgan Advanced Materials, BASF SE, Dow Chemical Company, GrafTech International, Taishan Fiberglass inc., CeramTec GmbH, Sinopec Shanghai Petrochemical Co., Ltd, Murata Manufacturing Co., Ltd., Anglo American plc., Mitsubishi Chemical Holdings Corp., Norilsk Nickel, Evonik Industries, Universal Laser Systems, Inc., and Corning Inc. This entry was posted in Polymers and Advanced Materials and tagged Ceramic, Communication, Glass, Instrumentation & Sensors, Laser Materials, Laser Materials Market, Laser Materials Market Analysis, Laser Materials Market Forecast, Laser Materials Market Growth, Laser Materials Market Outlook, Laser Materials Market PDF, Laser Materials Market Price, Laser Materials Market Report, Laser Materials Market Share, Laser Materials Market Size, Laser Materials Market Trends, Laser Materials Market Update, Lithography, Materials Processing, Medical & Aesthetic, Metal, Optical Storage, plastic, R&D & Military.